Unfortunately the STORE is now closed. We would like to thank all those who purchased items in the past for their custom. All items are embroidered or imprinted depicting the Gallagher crest or slogans. We ask you to support this store because, apart from this being the only outlet to purchase genuine Gallagher Clan products any profit made from these goods goes towards the running costs of the organisation. Once you place your order you should receive an acknowledgement email. You will also be asked for sizes, colours etc that you require if that is appropriate. 2. 100% cotton, bottle green colour. 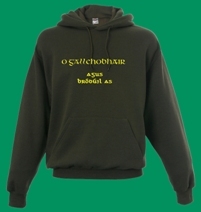 Printed front slogan: "Gallagher and proud of it", Back: In Gaelic "Ó Gallchobhair agus bródúil as". This is available in ladies and gents and in many different colours. Slogans of your choice can also be used. Please contact us with us with your requirements. Colours available: Ash, Black, Bottle green ( as above), Brick red, Burgundy, Chocolate, Classic Olive, Deep navy, Heather grey, Kelly green, Khaki, Light graphite, Light pink, Natural, Navy, Orange, Purple, Red, Royal Blue, Sky Blue, Steel Blue, Sunflower, White. Sizes: S 35/37", M 38/40", L 41/43", XL 44/46", XXL 47/49"
Colours available: Ash, Black, Bottle green ( as above), Brick red, Burgundy, Deep navy, Heather grey, Kelly green, Khaki, Light graphite, Light pink, Natural, Navy, Orange, Purple, Red, Royal Blue, Sky Blue, Steel Blue, Sunflower, White. Sizes: 3/4 26", 5/6 28", 7/8 30", 9/11 32", 12/13 34", 14/15 36"
In poly/cotton pique in a large colour range. It has the Clan coat of arms embroidered on the left breast. 100%cotton polo shirts also available. Gents: XS 34/36", S 36/38", M 38/40", L 40/42", XL 42/44", XXL 44/46"
Age: 3/4 26", 5/6 28", 7/8 30", 9/10 32", 11/12 34"
Sizes: S 36/38", M 40", L 42/44", XL 46/48", XXL 50/52"
Ages: 3/4 26", 5/6 28", 7/8 30", 9/11 32", 12/13 34", 14/15 36"
Ages: 3/4 26", 5/6 28", 7/8 30", 9/10 32", 11/12 34"
Along with the 2007 t-shirt (see above) this booklet must surely become a collector's item in the near future, given that it is a reminder of the first Gallagher Clan Gathering and the gaining of the Guinness World Record. And there are a limited number left in stock, which will not be added to. This booklet is much more than a programme of events and it will not age as it gives the history of the Gallaghers and mention of some of the notable Gallaghers down through the years and much more. It would make a suitable gift to anyone with Gallagher in their family tree. 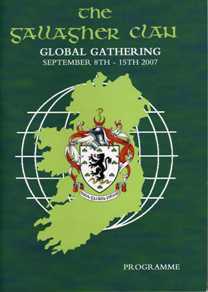 The mug has the Gallagher coat of arms with Gallagher on one side and Ó Gallchobhair on the other. A special edition hand worked plate produced for us by the world famous Belleek Pottery which is only available through us. Other items may be available on request, please e-mail for more information. We can also add graphics, slogans etc of your own, subject to approval. The cost of Post & Packaging (P&P) may vary depending on the item or group of items selected. As such it is difficult to compute at the time of ordering combined with the variety of possible destinations. (An indication of possible costs is given in the table to the right). However once we receive an order we will forward an invoice for the exact P&P to the customer via PayPal. The customer may then pay that amount via return trough the PayPal system. Alternatively if the customer is unhappy at that point of time and wishes to amend or cancel his/her order he/she can do so by informing us of such via postmaster@gallagherclan.org and all monies owing will be returned. If instead of using the BUY NOW PayPal buttons and shopping cart the customer forwards a list of goods required to postmaster@gallagherclan.org we will send them a complete invoice including the cost of P&P, through the PayPal system. The customer can then pay by return through the PayPal system using their credit card or their PayPal account. It is important to know that this is a very simple and safe method of payment and you do not have to register with PayPal to use this method of payment.